Home Johnnie Walker Johnnie Walker Red Label Summer Party Pack Press Release This suprisingly fun mix should be the go-to drink this summer! This suprisingly fun mix should be the go-to drink this summer! There's a better way to mix whisky. It’s general knowledge that cola goes well with whisky; it’s almost a default drink for avid whisky fans looking to mix their favorite dram. It seems we missed out on mixing whisky with clear soda because it also works, or if not, tastes even better – thanks to our friends from Johnnie Walker for introducing this surprisingly fun mix, with its Johnnie Soda serve. Johnnie Walker Red Label is the world’s number 1 best-selling premium Scotch whisky. It has a bold, smoky, characterful flavor that shines through even when mixed with the lemon-lime taste of clear soda. Create this satisfying drink with 1 part Johnnie Walker Red Label, 3 parts soda, ice, a wedge of lime for garnish (optional). As this hot summer season comes to an end, parties are being held left and right as people struggle to make the most of the remaining days. For those wondering how to spice up get-togethers, the Johnnie Walker Red Label Summer Party Starter Pack is the answer. 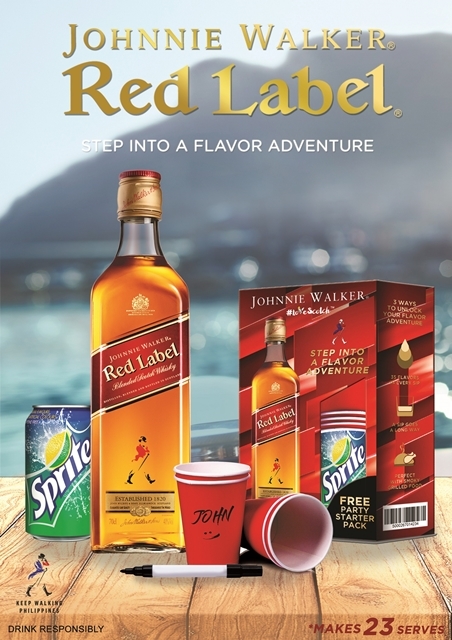 The Johnnie Walker Red Label Summer Party Pack comes with a 700mL bottle of Johnnie Walker Red Label, a can of soda to create the Johnnie Soda mix, red party cups to start the party, and a marker to point guests to their drinks. Believe the hype and make it an unforgettable #JohnnieSummer with #JohnnieWalkerPH. For only PHP 499 SRP, the Johnnie Walker Red Label Summer Party Starter Pack is available in all leading supermarkets nationwide. Summer adventures are best done with Johnnie Walker Red Label. Check out JohnnieWalkerPH on Facebook for more details, and use #JohnnieSummer and #JohnnieWalkerPH on Instagram.